Jamie Grace Harper (born November 25, 1991) is an American contemporary Christian musician, singer, rapper, and songwriter from Atlanta, Georgia. In 2010, TobyMac found her songs on YouTube and signed her to his label Gotee Records for two albums. She released the song "Hold Me" in 2011 which landed her a nomination at the 2012 Grammys and winning the 2012 Dove Award for New Artist of the Year. Grace was born Jamie Grace Harper and is the youngest daughter to James and Mona Harper. She grew up singing and playing instruments in both church and at home with her older sister Morgan. She was home-schooled with her sister, Morgan Harper Nichols. On July 16, 2006, she created a YouTube account and began posting videos of her songs online. Over the years her videos received recognition from Audio Adrenaline's Mark Stuart, David Mullen and eventually landing her a singing and acting gig with the television show iShine, and subsequent tour. In 2010 she was discovered by TobyMac and signed to his record label Gotee Records later that year. In August 2016, Jamie Grace and her sister, fellow artist Morgan Harper Nichols, announced her departure from Gotee Records. Grace's debut EP, Hold Me, was released by the label on February 22, 2011. Jamie Grace released the title track to the album at the same time and it was one of the most added singles to Christian Hit Radio stations. Her debut album, One Song at a Time, was released in stores September 20, 2011. Her second EP, Christmas Together was released November 29, 2011. Grace is featured as a main artist and speaker in the Revolve Tour by Women of Faith alongside artists such as Britt Nicole, Group 1 Crew, and Hawk Nelson. On May 4, 2011, Jesus Freak Hideout announced that "Hold Me," her first single, had attained the No. 1 spot at CHR. Her second studio album, Ready to Fly, produced by Christopher Stevens and David Garcia, was released January 28, 2014. The first single was "Beautiful Day". The second single available was "Fighter", an inspiring song of those who have struggled but don't give up. She was apart of the Winter Jam Tour 2015 West Coast. On November 25, 2016, Jamie Grace released "Party Like A Princess" to most major music streaming services. Released as a promotional single for both her 25th birthday and her upcoming third studio album, it ushers in a new sound from Jamie Grace. In a somewhat unique style, Jamie Grace combines elements of hip hop, folk, and pop into one distinct sound. In addition, she occasionally uses elements of guest vocalists, such as TobyMac in "Hold Me" and GabeReal from DiverseCity in "One Song at a Time" on Hold Me. Grace graduated from Point University with a bachelor's degree in children's ministry. She has Tourette syndrome and obsessive–compulsive disorder. Sometime in 2016, she was called up onto the stage at an Adele concert. She then sang a cover of "I Can't Help Falling in Love With You"—originally sung by Elvis—and Adele said that she had a great voice. 2016 "Party Like A Princes"
2011: tobyMac – Christmas in Diverse City; "Mary's Boy Child"
2012: Anthem Lights – The Acoustic Sessions; "In the Light (Acoustic)"
2012: Morgan Harper Nichols – Verge (single); "Verge"
2012: tobyMac – Eye on It; "Favorite Song"
2013: Colossal Coaster World (Lifeway's VBS); "Colossal Coaster World", "Change My Heart", and "I Will Trust in You". 2012: It Happened One Night: Celebrating Christmas and Freedom Around the World; "Away in a Manger"
2010: All Starz 2010; "Heads Up"
1 2 California Birth Index. "Jamie Grace Harper Born 11/25/1991 in California". California Birth Index. Retrieved April 7, 2015. 1 2 "Jamie Grace Discography, Jamie Grace Artist Database, Jamie Grace-Harper". jesusfreakhideout.com. Retrieved June 2, 2011. ↑ "Teens' creativity starts at home". ajc.com. December 10, 2009. Retrieved October 24, 2013. 1 2 "Info". Jamiegrace.com. Retrieved September 4, 2013. ↑ "Jamie Grace No Longer with Gotee Records - Announces New Music!". Retrieved September 5, 2016. ↑ Jesusfreakhideout.com: Jamie Grace, "Hold Me EP" Review jesusfreakhideout.com. Retrieved 03-23-2011. ↑ "Jamie Grace's Hold Me e.p. Releases Digitally, February 22". CM Spin. Retrieved April 2, 2011. ↑ Jamie-Grace Harper << The Revolve Tour revolvetour.com. Retrieved March 23, 2011. 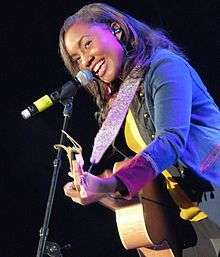 ↑ Jesusfreakhideout.com Music News, May 2011: Jamie Grace's Debut Single "Hold Me" Hits No. 1 jesusfreakhideout.com. Retrieved May 5, 2011. ↑ "Jamie Grace Reveals Upcoming Album 'Ready To Fly', Release Date, Features and More : BC News". breathecast. Retrieved February 19, 2014. ↑ "Album review: ‘Ready To Fly’ by Jamie Grace". The Underground. Retrieved February 18, 2014. ↑ "Ready to Fly: 5 Questions with Jamie Grace". Retrieved February 18, 2014. 1 2 Moring, Mark (November 21, 2012). "Jamie Grace is holding on". Christianity Today. Retrieved August 1, 2016. ↑ Sarachik, Justin (August 10, 2016). "Adele is Wowed by Jamie-Grace's Powerful Cover at Concert". Rapzilla. ↑ "Grace Unplugged – Christian Movie/Film DVD | Find Christian Movies on CFDb: Largest list of Christian Films". Christianfilmdatabase.com. Retrieved January 28, 2013. ↑ "Rumors of Wars". Christian Movies All in One Place, Easy to Find! CFDb!. Retrieved June 6, 2015.